Feeling relieved? You’re not alone in the financial services industry as 2017 dawns with pro-business Republicans controlling Congress and the White House. That doesn’t mean agents and advisors can relax and ignore what is going on in Washington. President-elect Donald Trump and lawmakers have an agenda that will affect the insurance world in many ways. Taxes: House Speaker Paul Ryan is determined to push tax reform and he may have his best opportunity. The result would be a significant tax reduction for investors. But can he and Trump come to an agreement? Fiduciary Rule: Trump has not commented on the Department of Labor rule specifically, but his surrogates have said he is opposed. The path to killing the rule is a little more complicated, but a delay is likely. ACA: The president-elect said repeatedly on the campaign trail that he would eliminate Obama’s signature health care program. But the practical implications of doing so are not insignificant. What can Republicans realistically accomplish? Editor’s note: After assessing the issues and variables affecting them, the InsuranceNewsNet editorial team came up with odds that successful reform will result. The Time for Tax Reform? This is Ryan’s hope, the one issue he has longed to see to completion. With a like-party president and a Senate majority, tax reform should be a slam dunk. Yet, it isn’t. Then there is the personality clash between Trump and Ryan, who refused for months to explicitly endorse the president-elect. Will those hard feelings be left in the past once the curtain comes down on inauguration festivities? For sure, there is ample promise for harmony between the Speaker and the White House since the two leaders share similar tax-cut plans. Both would slash the top income tax rate from 39.6 percent to 33 percent. Both would reduce taxes on corporations, in largely similar ways. 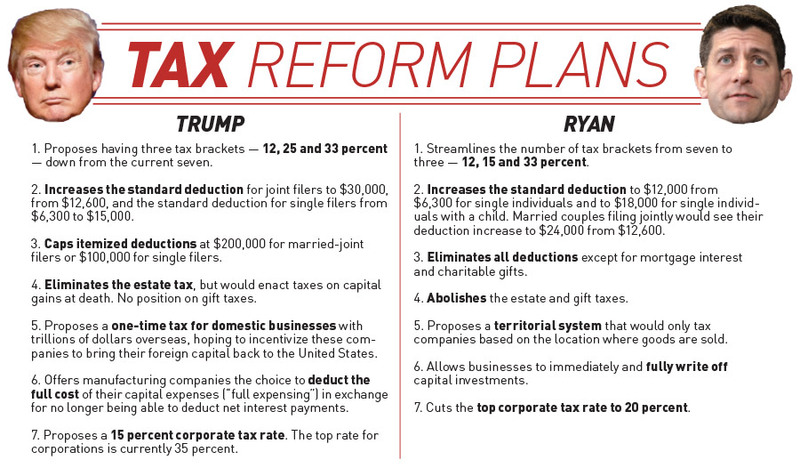 Ryan’s entire tax philosophy represents a move away from simply slashing the top income tax rate. Instead, the GOP is focusing on targeted tax cuts and exclusions to benefit high earners with investment income. The Ryan plan drastically slashes taxes on both corporate income and income from capital gains, dividends and interest. Likewise, it cuts the corporate income tax to 20 percent, and allows taxpayers to exclude 50 percent of their net capital gains, dividends and interest income. Some of those changes will make many in the insurance industry happy, but they might also be disappointed by the Ryan/Trump treatment of the estate tax. Trump supports full repeal and Ryan voted for the Death Tax Repeal Act of 2015. The estate tax has an 80 percent probability of being repealed by Trump and the Republican Congress, said Ken Kies, managing director of The Federal Policy Group, a Beltway lobbying firm. “Our best opportunity to stop this is to convince the Republican leadership that having Trump sign on to an estate tax repeal — something that would benefit his family — would be a disaster from a public relations standpoint,” he said. 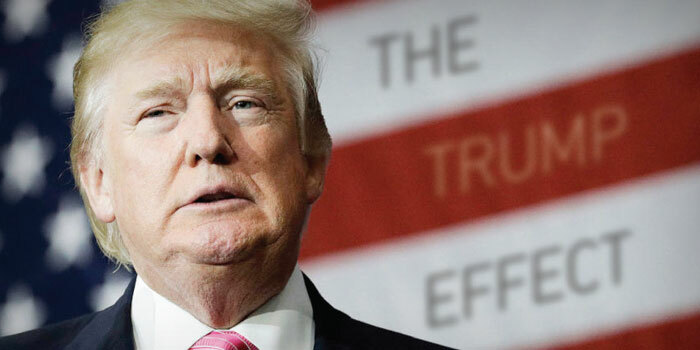 Kies predicted that Trump’s top priority would be what he called “one big budget deal” that would encompass repeal of the Affordable Care Act, an infrastructure program and tax reform. “And we think that will be done by the August recess,” he said. The incoming treasury secretary, Steve Mnuchin, promised 3 to 4 percent growth. The Trump plan to encourage repatriation of the estimated $1 trillion that large U.S. corporations hold in foreign subsidiaries will help offset the loss of revenue, Mnuchin said. Trump has proposed a special 10 percent rate on overseas funds the companies shift back to the U.S.
Is the Fiduciary Rule Toast? Trump did not mention the DOL fiduciary rule during the campaign, but Anthony Scaramucci, his top Wall Street advisor, assured the industry that the president-elect will work to defeat it. This is one issue where Trump and Ryan will find agreement. The Speaker is the top lawmaker to speak out against the DOL rule, which was published in April 2016 and is scheduled to begin taking effect on April 10. Since the rule is already on the books, however, getting rid of it will not be easy. The simplest thing Trump can do is delay the rule while the administration develops a long-term strategy for it. » Lawsuits. As of early December, opponents were 0-2 via the lawsuit route, with federal judges in the District of Columbia and Kansas rejecting plaintiffs’ requests for a preliminary injunction. That is not as bad as it sounds. After all, opponents need only to win one case out of the four to cripple the rule, whereas the government needs to win every case. A third lawsuit filed in Northern District of Texas court appears to be the strongest opposition case. The district, as well as its appeals circuit court, is known for being tough on government agencies. Judge Barbara M.G. Lynn heard the case Nov. 17 in Dallas. A group of plaintiffs are led by the U.S. Chamber of Commerce. » Legislation. The House Financial Services Committee has legislation ready to go, gutting both the fiduciary rule and the Dodd-Frank Wall Street Reform and Consumer Protection Act of 2010. The Financial CHOICE Act would block the DOL from implementing its fiduciary rule by incorporating it into the Retail Investor Protection Act, which passed the House last year. The bill eliminates several Dodd-Frank provisions, including federal “bailouts” and the Volcker Rule, which restricts trading activities at banks. The FSOC was created by Dodd-Frank to review the systemic risk to the capital markets presented by large, global financial institutions. MetLife has fought the designation, which was considered one of the reasons the company shed its advisor unit. The bill would also require the Consumer Financial Protection Bureau to be subject to bipartisan oversight and congressional appropriations. » Regulation. Perhaps the most effective route to terminate the fiduciary rule would be for Trump’s new labor secretary to suspend the rule while the agency crafts a new one. That would mean following the exhaustive process of public notice, supporting studies, public hearings and publication. But it would get rid of the rule without having to rely on getting a set number of votes. The incoming secretary of labor could direct the agency not to spend any resources to enforce the fiduciary rule. However, that would have no impact on the most severe aspect of the rule: the litigation exposure. 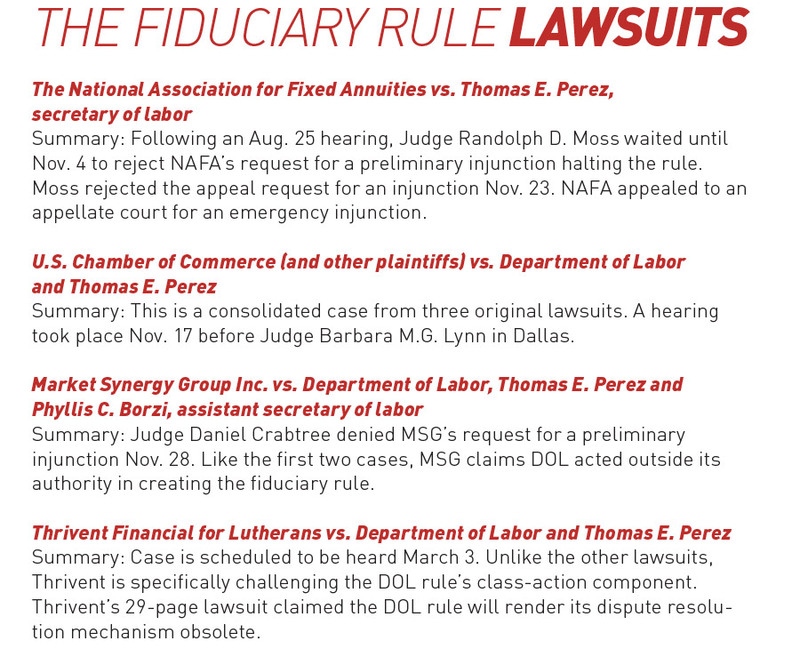 Now that the rule is published, if it takes effect on April 10, advisors will be vulnerable to private lawsuits. Trump and the Republicans may have dominated on Election Day, and the DOL rule may well be doomed. But Main Street advisors such as Taylor Sledge say they need to keep planning for a fiduciary world. For Sledge, founder of Sledge & Co. in Madison, Miss., that means getting additional licenses and spending more time on compliance issues. The 29-year-old Sledge offers a full array of financial planning services and said his small firm needs to be prepared for whatever regulations come from Washington. Even if the DOL rule eventually disappears, the Securities and Exchange Commission is working on its version of a fiduciary standard as well. 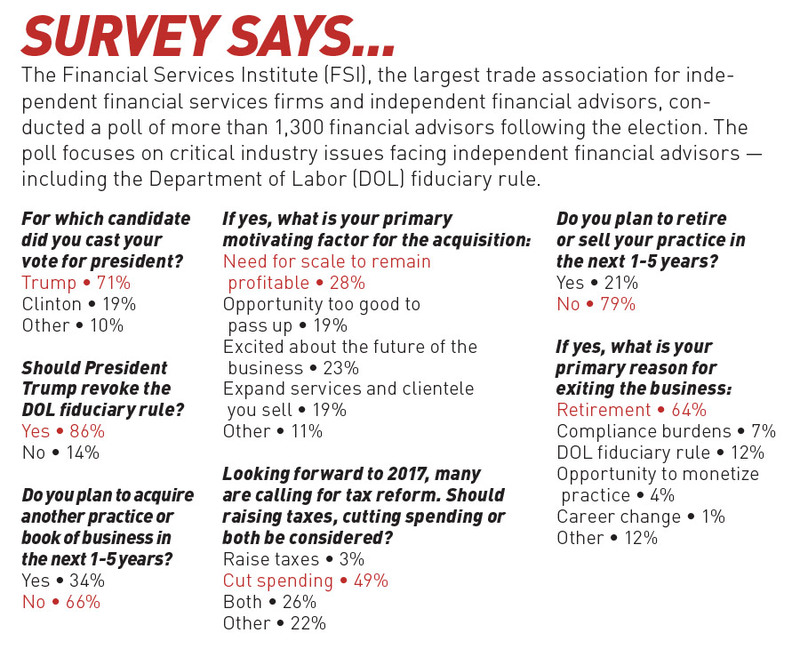 While the SEC is mired in political squabbling and has two vacant seats, many in the industry feel the agency should take the lead in developing a fiduciary rule. SEC Chairwoman Mary Jo White has said its fiduciary version is not close to completion. White announced she will resign and forgo the final two years of her term. That means Trump can fill three vacancies and short-circuit any regulation the SEC has in the works. Still, uncertainty remains, said Howard Schneider, founder and president of the consulting firm Practical Perspectives, Boxford, Mass. “As we’ve seen with so many things, there’s a lack of clarity with what that policy is going to be as there’s been no stand taken on the DOL fiduciary rule issues yet,” he said weeks after the election. Eszylfie Taylor, president of Taylor Insurance and Financial Services, Pasadena, Calif., has a foot in both worlds as a commission- and fee-based financial advisor. The DOL rule might be more impactful, but is not much different from many other regulations that constantly change. The advisor world is best focused on making the best of whatever happens, he said. Should the rule be abolished, “the annuities and commission-based products agents will be pretty ecstatic, I would think,” he said. But it’s hard to predict anything in the financial services world, he added. Those who predicted a market crash upon Trump’s election were stunned when the opposite happened, Taylor noted. Will the Overtime Rule Be Fired? Employers gained a bit of clarity in late November when a Texas judge granted a preliminary injunction freezing the Department of Labor overtime rule. Judge Amos Mazzant of the Eastern District of Texas granted a preliminary injunction to 21 state plaintiffs, led by Nevada. The rule affects an estimated 4.2 million workers who were to be newly eligible for time-and-a-half wages for each hour they worked beyond 40 each week. The rule would roughly double the $23,660 threshold at which executive, administrative and professional employees are exempt from overtime. The DOL estimates the new rule would affect more than 4 million workers, and 19 percent of all insurance industry workers. Mazzant ruled that the plaintiffs proved both the likelihood of winning a court case, and irreparable financial harm — two key standards often difficult to achieve to gain an injunction. The Labor Department could seek an expedited appeal to get the law free of the courts during President Barack Obama’s final weeks. Or the agency could drop the appeal after Republican President-elect Donald Trump takes office Jan. 20. The DOL has strong grounds for an appeal, said lawyer Erin M. Sweeney of Miller & Chevalier in Washington, D.C., but it might not matter. “Even with an expedited appeal, it will be the Trump administration that will have the final word,” she added via email. In August, Trump cited the overtime rule as an example of the type of burdensome business regulations he would seek to roll back as president. Employment lawyer Don Phin said the insurance industry isn’t the focus of the law. But that doesn’t mean the industry wouldn’t be affected in a significant way. Agencies would need to know the new rules on who is considered exempt because they are considered “administrative,” for example. Reached after the decision, Phin said it wasn’t “totally surprising” given the opposition and the court venue. He also agreed the overtime rule looks to be dead. “At the minimum they know they can drag things out to next term and give the Trump administration an opportunity to change the regs,” he said. Pulling the Plug on the Affordable Care Act? The centerpiece of the campaign, and the issue that analysts agree drove much of voter anger, was the Affordable Care Act. Trump vowed to repeal the legislation, and that puts him in complete agreement with GOP leadership in Congress. 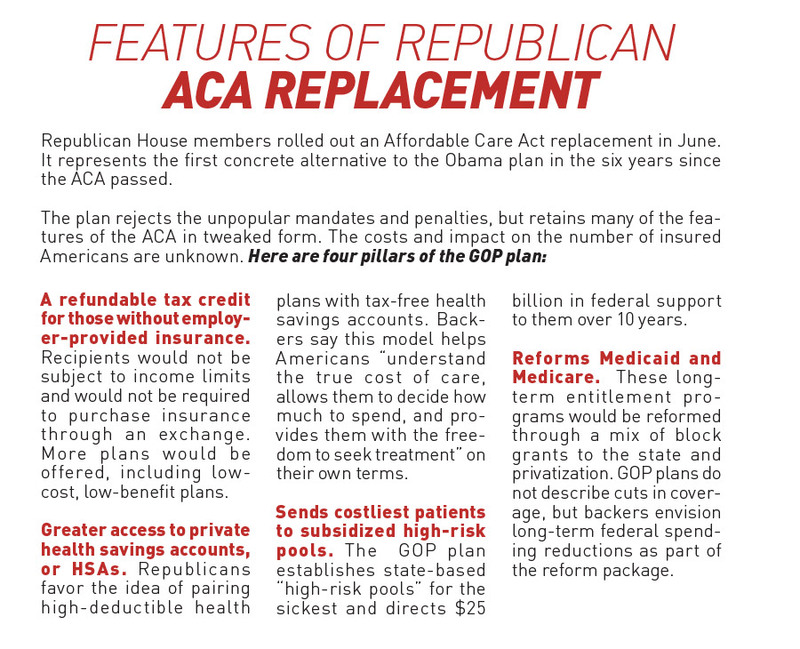 As of early December, GOP leaders were touting a plan to repeal the ACA without a replacement. That could give Trump an easy campaign promise to fulfill as early as his first day in office. But what would the eventual replacement legislation look like? The president-elect named House Republican Rep. Tom Price of Georgia as his secretary of Health and Human Services. Price helped craft a House GOP plan on health care that was unveiled over the summer, relying on individual tax credits to allow people to buy coverage from private insurers. The proposal fell far short of a full-scale replacement, leaving key questions unanswered including the size of the tax credits, the overall price tag of the plan, and how many people would be covered. Since the election, Trump has endorsed keeping certain popular parts of Obamacare, including a provision barring insurers from excluding people with pre-existing conditions from coverage, and another allowing young adults to stay on their parents’ health plans. Ryan endorsed keeping those parts of the law. But Democrats insist there’s no way to keep the popular parts of the law without the elements people don’t like, including requirements for individuals to carry coverage or face tax penalties. Insurers have said they can only extend coverage to people with pre-existing conditions by having large groups of customers, including healthy people who don’t cost as much to insure. Carriers would likely raise rates on the riskiest customers, assuming they would be allowed to adjust rates. NAHU is working with Trump’s transition team and favors an approach that would keep consumer costs down while ensuring the marketplace is stable. Any changes to the ACA will be modest and will be implemented over a period of time, said Susan Combs, founder and head of Combs & Co., an insurance brokerage firm based in New York City. “Remember that the GOP needs a supermajority and all 52 GOP and 8 Dems would have to vote on it, and I don’t think they can get it,” she said. As far as agents are concerned, “we were needed before the ACA, during the transition to the ACA and, yes, we’ll be needed during any changes that will come to the ACA,” Combs added. The different provisions of the ACA have many tentacles, which makes repealing or changing them a challenge, said Ronnell Nolan, president and CEO of Health Agents for America. A change to the unlimited maximum benefits is one under-the-radar ACA reform that can give insurance companies relief, said Ryan Siemers, principal with Aegis Risk, a health care consulting firm in Alexandria, Va. The ACA prohibits setting lifetime limits on benefits in any health plan or insurance policy. Before the ACA, individual medical expenses would hit the $1 million benefit cap that the employer had in the plan and the claimant would go to Medicaid or become a ward of the state, Siemers explained. Hospitals and pharmaceutical companies have benefited from the removal of caps, he added, making it difficult to amend that aspect of the ACA. “There are some deep-pocketed interests in the health care world that would work to stop any move to alter unlimited lifetime benefits,” Siemers said.